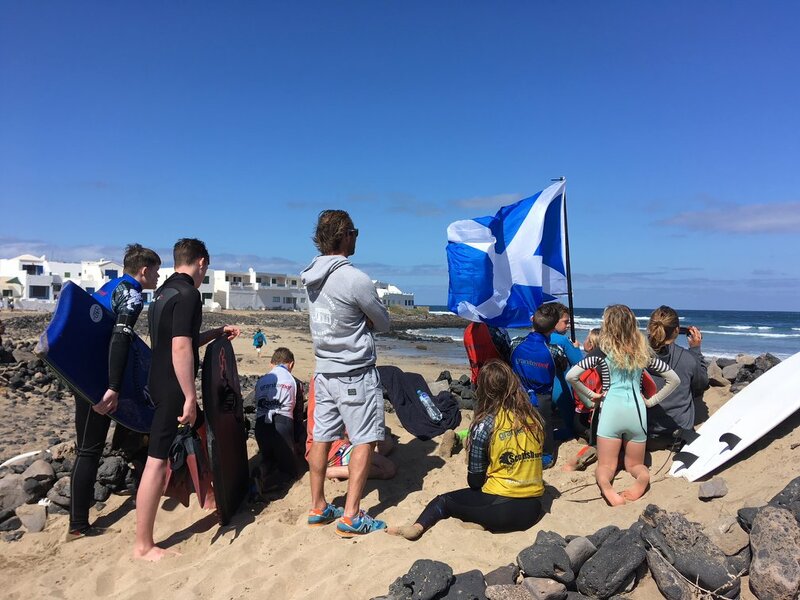 SSF Junior Squad Training Lanzarote 2018 short edit from Scottish Surfing Fed on Vimeo. 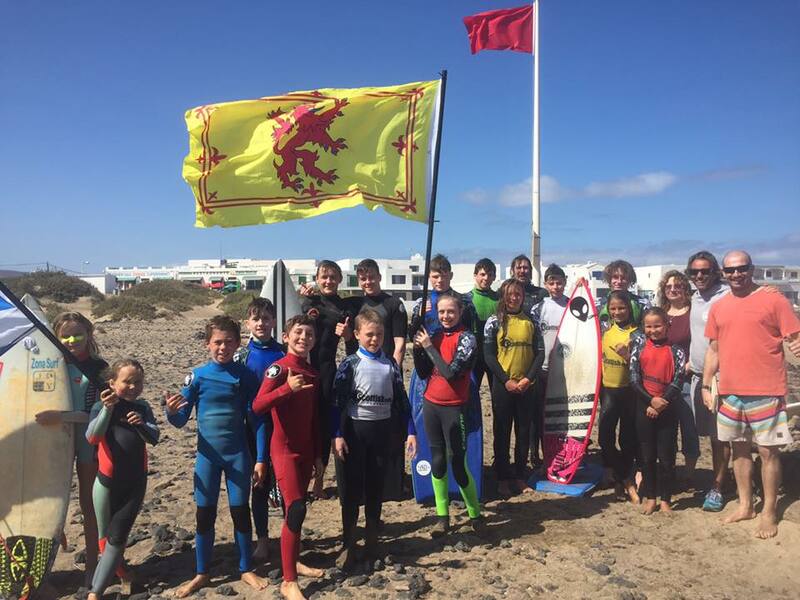 The Scottish Surfing Federation’s first ever Junior Surf Squad training camp took place from the 15th until the 20th of February 2018 at Playa Famara on Lanzarote. 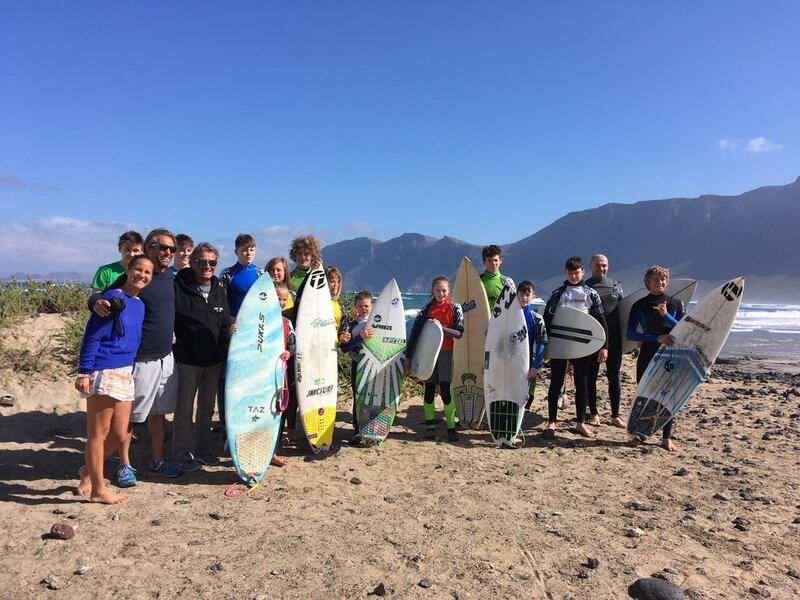 The squad was chosen from the results of the previous year’s national competition and also included a few up and coming young surfers. 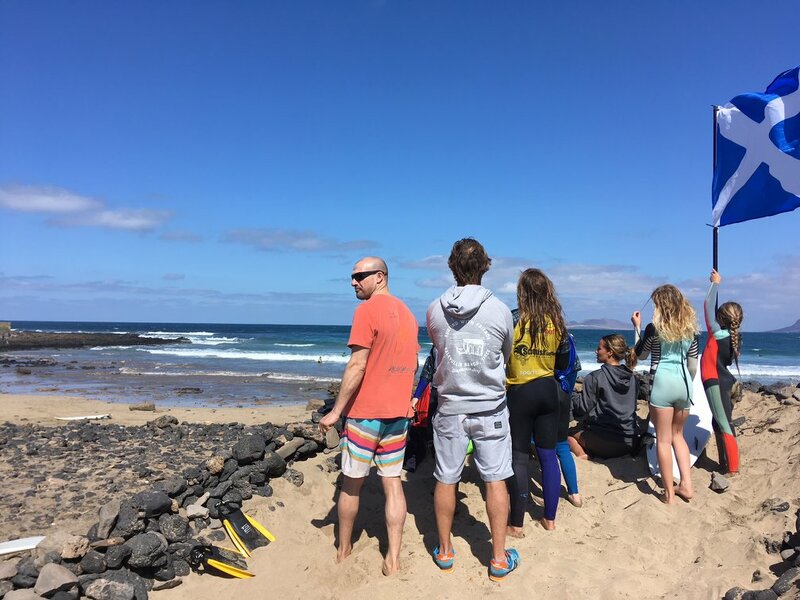 We flew out to the Canaries with six of the team: Craig McLachlan, the U14 national champion; Emma Swanson, 3rdplaced U18 girl and winner of the last two Sandend comps; supergrom Ben Kobedza, aka ‘Wee-er Ben’, who had won the U13 division at the Sandend Grom Comp; Noah Davies, a promising young Dunbar surfer; Mikey Wimbledon-Hall, who surfed his way to 2nd in the U18s and 3rd in the U18 bodyboard section; and Jamie Gibson who placed 2ndplace in the U18s bodyboard division. Also assisting with driving, organising and generally doing everything were Craig & Iona’s mum, Marcelle, and Emma’s dad, Neil. Regional coach, Marti Larg, was out in Lanzarote already along with his wife, Iona and their kids: U18 boys champion Ben Larg, aka ‘Wee Ben’; & his sister, Robyn, who is showing great promise, no fear and a formidable carving style in the skatepark bowl. Finn MacDonald, the U16 champion and Iona McLachlan, the U18 girls champion, were also already on the island. With our squad of ten surfers assembled we managed to sneak in a few hours of freesurfing on the first evening. The location of the house couldn’t have been better, with easy access to a good fun beachbreak that offered the exact conditions that we tend to face in competitions. The surf was massive on the reefs for the first few days but the reef in front of the beach protected the West end of Famara beach so we could always find a surfable reform wave. Unknown to the group we sneakily filmed the first session so it would give an idea of what to work on for the trip. We woke the following morning to solid surf and some welcome sunshine. The tide was too low so after breakfast we decided to start with some video analysis of the surf from the previous evening. Going through the video footage it became apparent that we had a fairly common theme to work on – the bottom turn! Handily for us; Robyn, Ben Larg and Finn had their Smoothstar skateboards with them so we had a training session and warm up on them with really useful input from a couple of local rippers; 10 year old Conner & 12 year old Dylan Dos Santos. We then put the analysis and skateboard training into use on the water. Day three started with video analysis and input from the Dos Santos brothers and another local, 16 year old Christian Portelli, who Marti arranged to assist with coaching Christian recently placed 12th on a World Qualifying Series event so it was great to get input from such a high level junior surfer. It was then onto the water coaching for more coaching from Christian. To see him surfing made you realise what was possible on the waves and was inspirational for our team. We also grilled him on competition tactics that we would be implementing the next day. Even though it was a mock competition, it was surprisingly competitive and the surfers were giving it their best. Everyone had different approaches, with some racking up scores on the inside whilst others opted for the set waves. The competition showed the importance of tactics, preparation and composure – it wasn’t necessarily those who were free-surfing the best that did well in competition. We ended the day with a trip to the excellent indoor skatepark in Arrecife. There is a fair amount of skateboarding talent amongst the squad: from smooth bowl carvers; mini ramp demons; and street skating tricksters. I didn’t want to show them up with my skateboarding prowess so I decided to film it instead…. On the final day we did the usual video analysis then some skateboard training. I then went in surfing with Emma, Craig & Ben K at the beach as they felt they would benefit more from surfing there. The waves had dropped a bit but there were still some shoulder high sets. The break was really quiet by then and they caught loads of good waves. 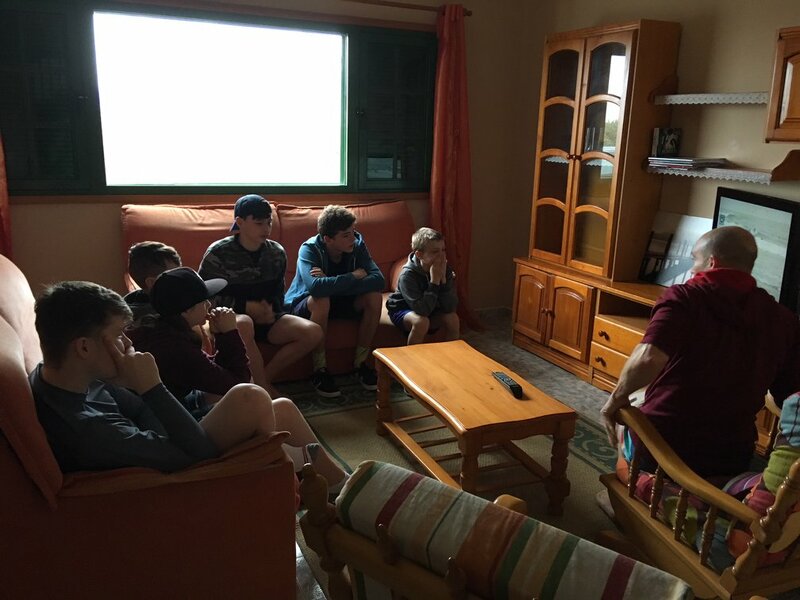 Marti and Neil took the rest of the kids off to La Santa as they were keen to try out the inside break, El Centro, and get a feel for the reefs. They thankfully came back without any reef scrapes, urchin spines or encounters with angry locals. The next morning we had a 4am start to make the plane, which the team dealt with admirably. We also had a priceless encounter with a curious customs official upon arriving in Glasgow that I’m sure made their day. Everyone’s surfing improved, as did their fitness and knowledge on what aspects to work on and competition approach. To get 4 or 5 days of consistent surfing and coaching in warmer climes during February is of huge benefit to our junior surfers. 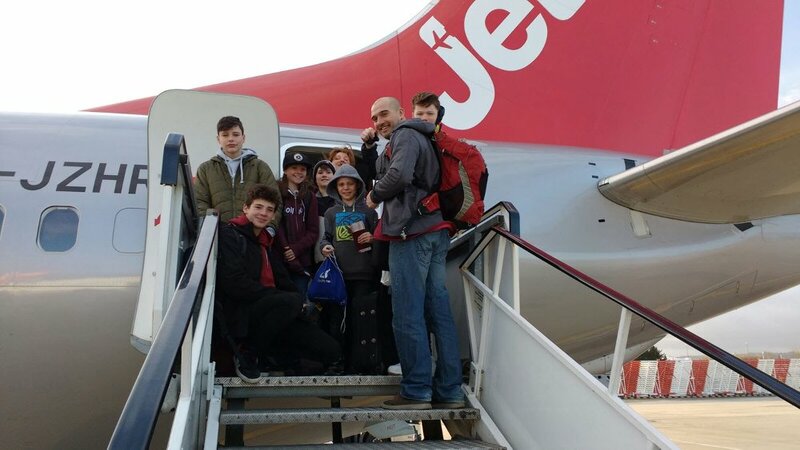 The squad all have plenty to take away from the trip which will hopefully help them in the future. Each member of the group had different areas of technique to concentrate on but it was good for them all to analyse each others surfing and learn from it. Thanks to Marti & Iona for helping with the organising and booking the flights & accommodation. Thanks to the Dos Santos family and Christian Portelli for their input and being so welcoming to the Scots. And finally a big thank you to Marcelle Lockhart and Neil Swanson for running everyone about, doing the chores, getting everyone organised.